"This had better be worth it," I muttered to myself as I hopped up and down to stay warm. We had risen at 3:30AM to drive up to the top of Maui, along with half of the island, it seemed, to witness the Haleakala Sunrise. It rained on us from time to time at sea level, but it cleared as we neared the mountain. As we ascended the dark and winding road, we entered the clouds. We hoped our rental car would punch through the top of the clouds, showing us a dazzling display of stars once we reached the visitor center at the top. It didn't, and the temperature gauge dropped and dropped. 42...41...40...39... Sheesh, how cold was it going to get up there? I stepped out of the car into the darkness and was immediately blasted by moist air, chilling me to the bone. I hopped back into the car and started adding layers. The rest of my family got out to take a look but then went back inside the car. Too cold. On Maui. This close to the equator. We were, however, at over 10,000' in elevation. That makes a difference. 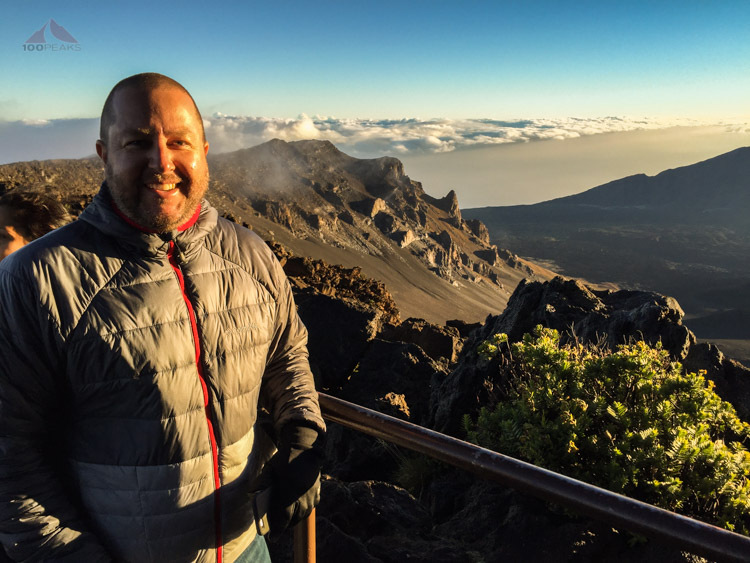 Since I took the trouble to wake up early, and I was wearing my TurboDown jacket, I decided I was going to claim a spot on the edge of the mountain and wait for the sunrise. Surely the clouds would part for us. I hunkered up next to the railing that glistened with dew in the light of my iPhone. People around me were wrapped in ponchos, hotel pool towels and blankets, and anything they could get their hands on. There was a dim glow on the horizon, which let everyone know which direction to look. A river of clouds flowed over our heads from behind, which was a relief, because otherwise our faces would have frozen in a collective grimace. The clouds continued downward in front of me, making me feel like I was standing under a waterfall of fog. Occasionally, just for a second, the clouds would part and I would feel like I was standing on the edge of the universe, witnessing the birth of a star. Gasps from the masses emerged all around me. They saw it, too. Wow. This was worth it. For that split second here and there. I teared up. 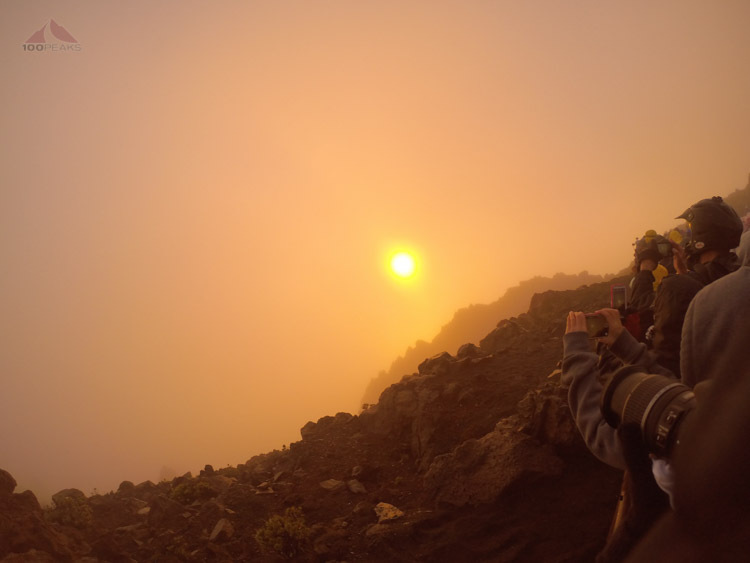 The Haleakala Sunrise was truly beautiful. My preference would have been to hike solo up to a remote peak to witness something like this, but it didn't matter. For those moments, staring off into the glowing abyss, I felt alone in a primordial, comforting way. We all stood there, wanting to see it again, but the clouds got thicker. The sun cast us in an orange glow as everyone gave up and went back to their cars to thaw out and get breakfast. I, also, went back to our car to share what I had seen. We chatted and joked around for a bit, having a snack. We looked up. Everyone was gone. And so were the clouds. It was still frigid out there, but the sun hovered nobly over the lower cloud layer. We walked out to the railing and had the view to ourselves. A small group of us went over to the now open visitor center and took some shelter there and learned about the mountain from the rangers. We took our time and enjoyed the view of the 'crater' from inside and out. We then decided, upon my peakbagging insistence, that we make it to the actual summit of Haleakala. We drove up to the now empty parking lot and walked the short stairway to the top. Not much of a mountaineering adventure, but it was still a very cool experience. We headed down the mountain, got some breakfast, and continued with our leisurely vacation. Every once in a while, as we were driving around the island, I would look up and see Haleakala looming over Maui. Sure, seeing the Haleakala Sunrise was early, cold, and crowded, but it was totally worth it.